It's a String ThingChallenge: Ice Blue Strings!!! What a weekend so many of you had!! 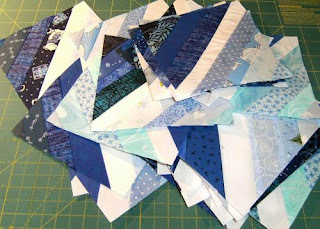 After reading your blogs and seeing the amount of snow that so many of you got, I had to make a quilt that reminded me of these ice cold winter temperatures. I just couldn't believe it. How do you get around in all of that white stuff? 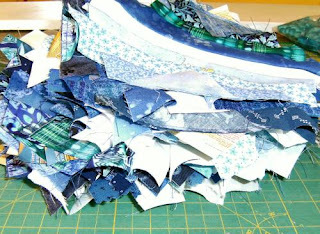 Or do you stay in and make quilts? I especially enjoyed seeing Judy's photos from Iowa. Judy, do you actually get mail delivered in all that snow? We reached 32 degrees here as our high here yesterday. That is considered brutal for me. I stayed in all weekend and finished this quilt. 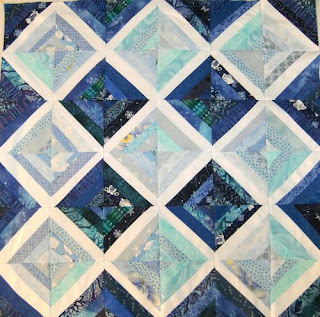 If you got an invitation to participate in this blog, please feel free to post your pictures and share your string quilt progress with us. Just beautiful, I love your planned strings. I hope to make one next month. Right now I am working on a scrappy one. Just 4 to 8 blocks to go.